The LERN laboratory, part of the IFREMER institute in Normandy, France, monitors the quality of marine and coastal ecosystems to ensure safe shellfish production and protect consumer health. IFREMER/LERN (Laboratoire Environnement Ressources de Normandie) regularly performs seashell toxin extractions and seawater nutrient analyses. If toxin concentrations exceed a certain limit, tough decisions up to and including banning fishing are made to preserve consumer health. Due to the high health and business impacts of such a decision, the laboratory must constantly improve its quality assurance system. Service technicians calibrate all pipettes used in extractions and analyses at regular intervals. In between calibrations, internal personnel verify pipette performance by gravimetric quick-checks carried out on the laboratory’s balance. Performed on a quarterly basis, these pipette quick-checks are essential to ensure pipettes remain accurate between calibrations. For these tests, the balance is quickly converted into a pipette check station and an evaporation trap is added. Full pipette maintenance and calibration is performed once a year to ensure ongoing traceability. Do you skip pipette checks because you feel they're difficult to perform? 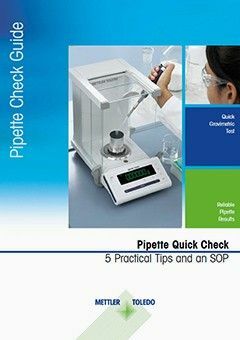 Find out how easy it is to reduce pipetting risk in our free Pipette Quick-Check Guide! All you need is a balance, a vessel, some deionized water and our free guide for a standard operating procedure (SOP) to uncover malfunctions and eliminate surprises at your next calibration. Adding an evaporation trap can help improve accuracy as well. Pipettes get dropped and parts wear out. Therefore, we recommended verifying pipette performance by doing a gravimetric quick-check of your pipettes on your laboratory balance. This is an excellent way to ensure the accuracy of your data and reduce overall pipette failure risk.